One of the joys of The Tiltas Trust is how one project or set of ideas leads to another, in a way that no-one can quite foresee. The latest link, between St Ann’s Hospice in Manchester and Kaunas University Hospital is one such. Our contact with St Ann’s came about through a scheme for recycling redundant equipment which Wendy Howe, one of our Trustees, has been running in a private capacity. This equipment ranges from walking frames and other domestic items, which are often now supplied in the UK for one-time use only, to hoists and special baths which become available when hospices or hospitals refurnish or upgrade. A good relationship with a Lithuanian transport company gets this equipment shipped at no cost and willing volunteers look after its distribution in Lithuania. St Ann’s is a big, multi-site hospice providing services across Greater Manchester and, following an upgrade of its Little Hulton site, various items, including a special bath for immobile patients and a couple of hoists, became available and have been put to good use in Lithuania. 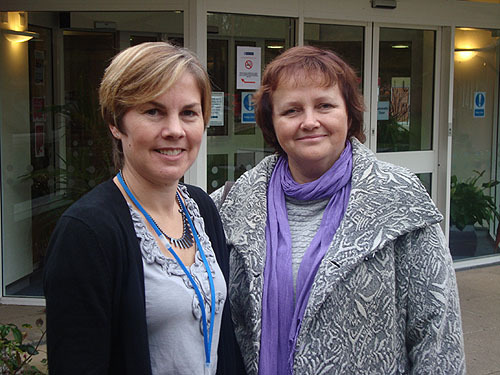 When we discovered that Dr Dalia Skorupskienė, Palliative Care Lead at the University Hospital in Kaunas, was in Manchester for a Geriatric Oncology Conference, the Trust took the opportunity to organise a half-day visit to St Ann’s at Little Hulton. Dr Skorupskienė was accompanied by Wendy Howe and Tom Macan from the Trust and by Nijole Gasiunienė from Manchester who helps with the equipment recycling. St Ann’s represents the changing face of hospice care in the UK: at the forefront of palliative treatment for the last four decades, it provides free care to more than 3,000 adults each year with life-limiting illnesses. While patients who will die there occupy about half of its 18 beds, other patients are in for temporary respite or stabilisation before returning to their homes. There are also day-care and outreach programmes run in close cooperation with local Social Services and a professional staff backed up by a raft of cheerful volunteers. Dalia Skorupskienė said that she had found her first visit to a UK hospice most interesting and rewarding, and took back a number of ideas for development in Kaunas But it was most encouraging that our St Ann’s colleagues expressed interest in developing links with medical centres in Lithuania where palliative care services are at an earlier stage of development. Given St Ann’s has vast experience, their advice and expertise could be most useful, especially in developing facilities in Lithuania. The Trust are now looking at how best to take forward this cooperation and hope that it may be possible to facilitate a visit by senior St Ann’s staff to see what is happening in palliative care in Lithuania. 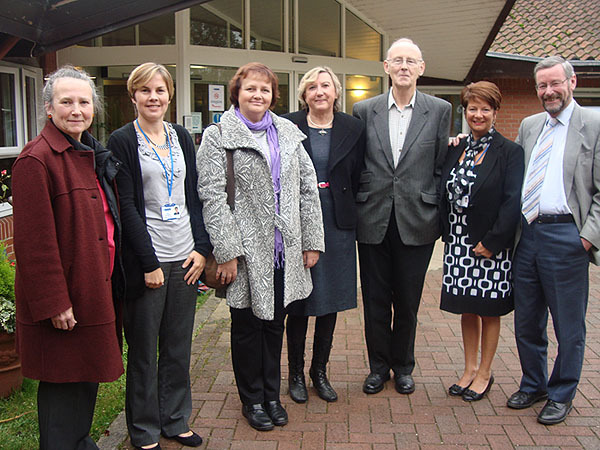 Pictured at St Ann’s Hospice at Little Hulton are (from left): Nijole Gasiunas (Lithuanian volunteer), Sian Burgess (Registered Manager, St Ann’s Hospice), Dr Dalia Skorupskiene (Palliative Care Lead, University Hospital, Kaunas), Wendy Howe (Tiltas Trust trustee), Tom Macan (Tiltas Trust trustee), Julie Foley (Support Services Manager, St Ann’s Hospice) and Peter Howe (Treasurer, British Lithuanian Society). Special guest: Dr Dalia Skorupskiene (right), Palliative Care Lead, University Hospital, Kaunas,Lithuania, is welcomed to St Ann’s Hospice at Little Hulton by Registered Manager Sian Burgess. This entry was posted on Saturday, November 10th, 2012 at 4:41 pm	and is filed under Uncategorized. You can follow any responses to this entry through the RSS 2.0 feed. Responses are currently closed, but you can trackback from your own site.